The Vampire Diaries will get you discharged! Navy Petty Officer Stephen Jones, stationed at the Naval Nuclear Power Training Command in Charleston, South Carolina, is being discharged from the military after he fell asleep in his bunk with a fellow officer. The two reportedly fell asleep after watching the CW’s Vampire Diaries in their boxer shorts, which admittedly sounds pretty gay. When Jones’ bunkmate returned to their room that night, the two awoke and the sleeping friend left immediately. 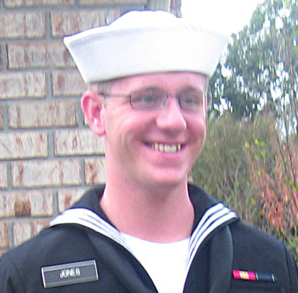 Jones’ bunkmate alerted their superior officers of the sleepover, and not the Navy is proceeding with discharging him. “It is a violation of the Command Instruction for sailors to act unprofessionally in the barracks. It is considered unprofessional conduct to share the same bed in Navy barracks,” said Thomas Dougan, a spokesman for the Naval Nuclear Power Training Command. Jones, who claims nothing sexual happened, said they were both clothed, him in pajama pants and a white t-shirt and McGee in boxers, and that two were not under the covers together. Jones was lying above the covers while McGee lay below. Jones’ roommate, who was uncomfortable by what he saw, according to Myers, Jones’ attorney, moved out of the room a day later and reported the incident to command officials. An investigation was launched, ending with the Command attempting to punish Jones and McGee by a “Captain’s Mast,” a non-judicial procedure meant to avoid a court martial. “I’m not pleading guilty to something that I didn’t do. I did not commit a crime,” said Jones. “I am the type of person that takes responsibility for my actions. If I break a rule, I take my punishment. And I know I did not break any rules.” Myers also said he is adamant that no crime was committed. “In the end, Jones was charged with falling asleep while watching a show on his computer while on his bed over the covers where another man under the covers was also sleeping. This is not a crime and never will be as there was and is no duty to avoid such a circumstance as a matter of laws,” said Myers in a statement sent to the Navy. Jones would not comment on his sexual orientation saying, “that is my business and my business alone”. How exactly is this any different from Don’t Ask Don’t Tell? Besides the part where Jones has neither told anyone he is gay, or been caught doing anything gay. In fact, this is worse! Are you angry to hear about the Navy’s new excuse for discriminating against American soldiers?